A throw back occurs when two genes come together that have been hidden for many generations. A throw back can be a puppy that grows to a large size in comparison to the parents. 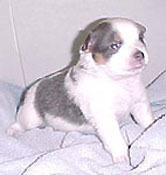 Meaning this one pup grows to be 23 pounds out of two 12 pound Rat Terriers. It can be a strong resemblance of say a Fox Terrier, where a particular pup strongly has the structure of the Fox Terrier as opposed to the structure of a Rat Terrier or more closely resembles the Chihuahua. Although you can not see any of these traits in either parent nor grandparent or great grandparent for that matter, when the two genes that have lay hidden come together they produce this "throw back". Long hair in the Rat Terrier is another example of a throw back. Because the Rat was originally made up of many different breeds of dogs, there is the possibility of a long hair dog lying somewhere in the past history of the rat. It may be from a long hair Dachshund or the Spitz or even the wire hair Fox Terrier. The long hair has been reported several times by different breeders all over the United States in the last several years and this is the focus of our article. 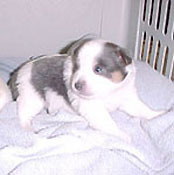 It has been reported that the pup is born with longer hair and becomes quite fuzzy as he grows. The actual length of the hair can vary from throw back to throw back but it is very obviously detected. It is much longer and much thicker than even a fully dense plush coat seen on the Rat. Even on dogs whose history can be traced more than 7 generations back with out an incident of long hair can produce a throw back. The dogs do not have to have a common relation, however somewhere in their ancestry there probably was a common denominator or at least came from the same region. Shown here is a pup from Casa de Rats that produce such a throw back and was generous enough to share it with us all. As you can see the hair length is not tremendously long as one might think when you speak of long hair but is long in relation to what the Rat Terriers hair length normally should be. Casa de Rats reports that the pup began to lose some of its longer hairs after about the age of 8 weeks. They also report that the tail curled somewhat over the top of the dogs back before the tail was docked. 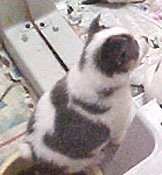 This could indicate a relation to the breed Spitz which may have been used in some regions of the US very early on in the development of the Rat Terrier. These "throw backs" whether they be long hair or the resemblance of another breed or something else that might be quite different should not be looked upon as a defect or mutant but more of the complexity of what goes into the makeup of all animals and how they originally developed.